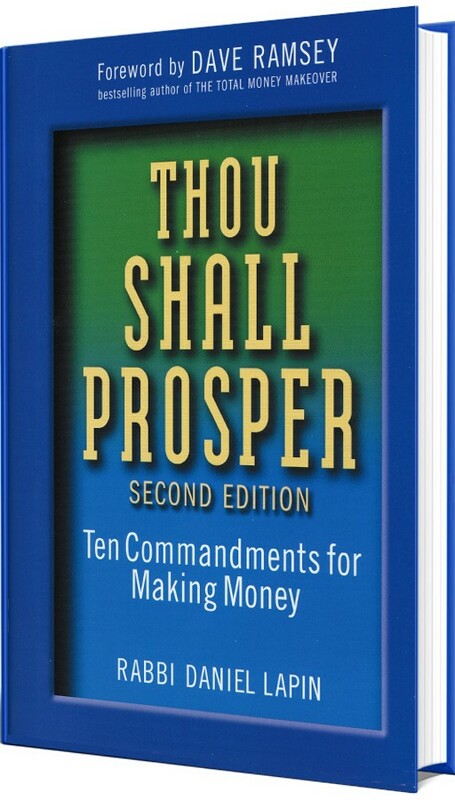 “Thou Shall Prosper, the Ten Commandments for Making Money”, written by Rabbi Daniel Lapin, is a must read for anyone that wishes to grow as a person. I feel that this book can teach something to anyone and it’s definitely worth the time to read. I want to share a few practical things that I took away from this book. Leadership, business sense and retirement are a few of the topics, however, this book has much more to offer so make the time to read it. The fifth chapter is titled “Lead Consistently and Constantly” and I want to highlight three points. – A change of culture or systems should be slow while a change (removal) of people should be quick. Coming in late to work is a choice that spreads to other team members. Looking forward to leave work because you don’t enjoy what you do leads to a poor attitude negatively effecting others. – People, processes and products change but core values should never change. If people are negatively impacting the workplace, including yourself, either fix the attitude or let go of the individual. Alternatively, the mission of your business should be sound and constant. – Profit is a way to measure the success of a business. Profit matters in business: if you cannot afford to give your team members adequate raises because of poor profits, do not expect that they will stick around for long. Leading people is an evolving skill. Be the example that you want your team members to emulate and treat them as if they are already high performers. Hold high standards for yourself and your team. The seventh chapter is titled “Learn to Foretell the Future”, it highlights that you should be identifying trends in your business. Rabbi Lapin talks about taking in account culture to help predict the future. This topic is difficult for me to understand but I relate to it best this way. An approximate timeline of ‘recent’ invention phenomenons would be plastic production in 1950’s, mainstream computer use around 1975 (culture of video games or workplace computers) and widespread internet acceptance in the 2000’s (the culture of an online world, email). If you could see the trend of what is coming next, you could prepare your business to be ready around 2025 for the next big revolution. I do not have the answer, but it is fascinating to reflect on. Selfishly, this was my favorite chapter because I loathe the thought of dying old and bored in retirement. I’d rather be working until I dropped dead than retire around 65 to rot away and do nothing. One point Rabbi Lapin made is that retirement is selfish. You are stealing away your productivity from the world when you stop working and aren’t useful to anyone. When I reflect on that, it makes me value myself and my work. We all make a difference to someone when we work. We need to have pride in that value we bring to the table and don’t seal it away in retirement. I cannot recommend this book enough and my small summary does not do it justice. Many more words of wisdom are ready to be absorbed and I am grateful for the time spent reading. I encourage you to pick it up and I made another post here about character that was also inspired by this book. Thanks for reading, cheers! At the time of this post, his site has this book for sale here.